They are available in different shapes in extruded PVC and Humidification process is uniform CFM of air passing through the spray they are fixed with a set of aluminium fixtures with PVC guides can be quickly removed allowing an easy entry into the spray chamber. A Louver is a window blind or shutter with horizontal slats that are angled to admit light and air, but to keep out rain and direct sunlight. 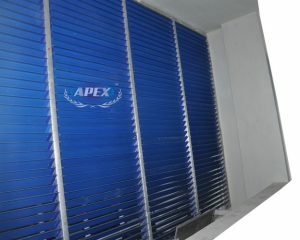 The angle of the slats may be adjustable, usually in blinds and windows or fixed. Apex Humidification Engineers distributes Louvers which are made PVC. They are available in different shapes which are made through Humidification process with uniform CFM. The air passes through the spray which is fixed with a set of aluminium fixtures. These PVC guides can be easily removed allowing an easy entry into the spray chamber.